My Paella Pan ! | La Rosilla - Lifestyle and food. This is my guest post as featured on the Cooking Outdoors blog . So much fun sharing recipes & experiences around the world. You can follow The Outdoor Cook on Twitter here @cookingoutdoors. Paella or Arroces, have become part of my families’ new life, since emigrating from the U.K to Andalucia Spain 7 years ago. 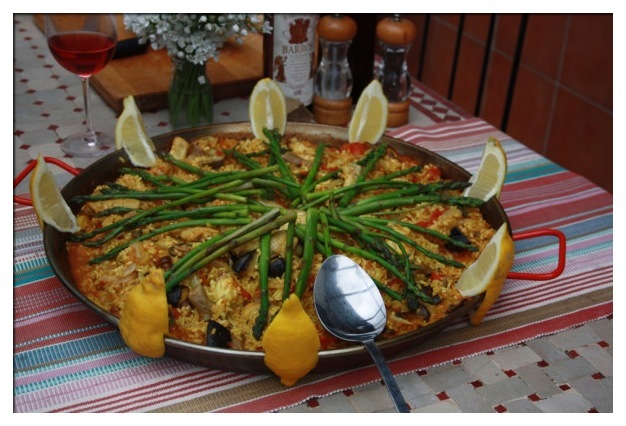 Paella is a dish prepared with love and gusto, to be shared with family, friends & neighbours. It is a dish offered in most Ferias of Spain throughout the year, and comes in many guises depending on the area of Spain you live in. From the traditional Paella Valenciana, with meat & seafood, to modern-day arroces (rices) & paellas adjusted to use what it is in season, or to suit the diners. 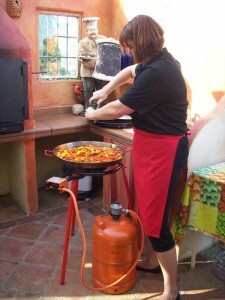 Paelleras (paella pans) range in size from a 4 portions to massive pans measuring meters across, to feed a whole town. This giant paella is a spectacular cooking outdoor event, when people gather from far around, to watch and taste the local dish. Cooked above a wood fire, these experts tend their giant pans of rice, meat & stock, until the dish is ready, rested and waiting to be devoured. Often taking hours to prepare & cook, eaten in moments. 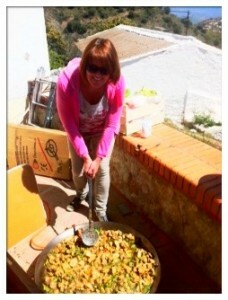 I like to cook my Paella on a warm summer evenings just as the sun is setting over the mountains. I usually cook a 15 portion Paella, as leftovers are delicious. I use a large pan and special Paella gas burner, which make it very portable, and I can cook anywhere, beach, camping & picnics. It is a very social affair, often friends gather around the ring whilst cooking, many times offering their suggestions or preferences and expertise for the perfect Paella. A favorite with my Family is Chicken, chorizo, asparagus and wild mushroom. The secret is to have all ingredients ready prepared, so you are ready to cook. 1 large chorizo sausage, skinned and cut into 1 cm slices. 2 sachets of Paella seasoning or ½ tsp each of Paprika, turmeric, fenugreek. 1 hand of Asparagus, trimmed. Prepare the chicken by marinating in olive oil, thyme, slat and pepper. Make up stock and add saffron to infuse. Put a layer of Olive oil in your Paella Pan to cover the bottom. Heat gently, add your whole Nora pepper, then chicken and thyme. Brown the meat nicely, then stir and fry 10 mins. Add onion, garlic and peppers – Fry for 5 mins until soft. Add tinned toms, and break up in pan, add white wine & stir & bubble. Stir in seasoning / spices. Add handfuls of rice around the pan, to let rice absorb some of the juices, stir. Pour in stock and saffron, stir so rice is distributed evenly. Simmer for 5 – 6 mins then reduce heat to medium low. DO NOT STIR ANYMORE cook for 20/25 mins until all liquid absorb, you may need to add a little more – you want you rice to be ‘al dente’. 5 mins before end of cooking, lay the Asparagus on the top in a circle, it will cook in the steam. Turn off heat, and cover with a clean cloth, foil or as sometimes in Spain newspaper, to rest and flavor infuse. Decorate the edge of the pan with lemon wedges, and sprinkle on some more fresh thyme.